Noel Thurgate chose Peter Powditch as a subject out of admiration for his achievements as an artist – ‘as well as the undeniable fact that he has a great head’. 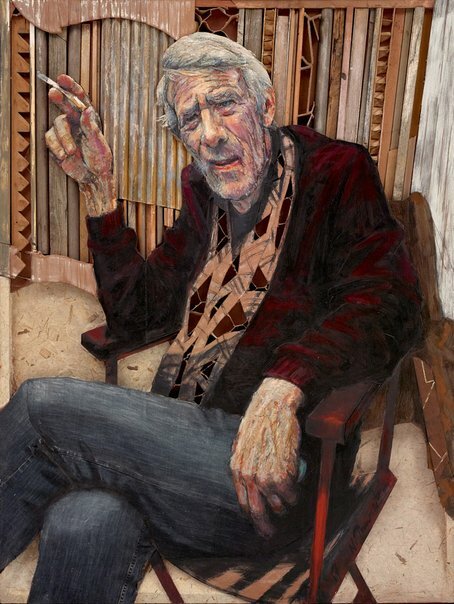 ‘The assemblage of materials and textures in the painting are a tribute to Peter’s magician-like abilities with masonite, empty cigarette packets and other found objects,’ says Thurgate. Born in 1955, Thurgate lives and works in Berrima in the NSW Southern Highlands. He has over 30 years’ experience exhibiting and teaching. This included nine years as head of drawing at the National Art School, Sydney. He was an Archibald finalist for three consecutive years from 1977.